Would you let a Steelers fan into your home? Thread: Would you let a Steelers fan into your home? You can’t trust the inbred. Eye would never let any White man into my home. Haha. For a minute I thought That was the aftermath of the fight I saw, but I was sitting on the other sideline. There was some sort of scuffle, but I couldn’t tell what was going on... I was sitting in the club seats I wasn’t with the peasants. I also don't like when young millennials call me "sir"
Check this thread for all of the upcoming Wu-Tang concerts. Check this thread for all of the upcoming Wu-Tang release dates. Lol jesus. 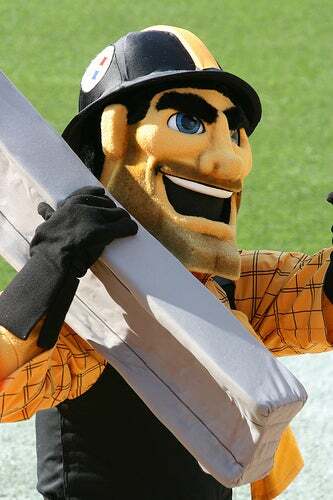 The mascot is actually named Steely McBeam? It looks like Adam Carolla. DQ Builders 3 is looking good. Not sure what DQ builders is. I might actually get a DQ blizzard and play a quick game of tetris this weekend. Wish we could all do this as a group and share those positive vibes with Noel.